Each time this card destroys 1 monster on your opponent's side of the field and sends it to the Graveyard as a resut of battle, increase the ATK of this card by 500 points. Basically, a 2000-ATK one-tribute monster that gets stronger after killing a monster. ...Yeah...not so great. I’d rather play Summoned Skull -- it’s like a Millenium Scorpion that already attacked once! Omg broken!! With other one-tribute monsters such as Jinzo, Thestalos (;)), and Airknight Parshath, why would you play this scorpion thing instead? Just...no. Please don’t use this card. Rating: 0/5, simply for the fact that you should not be using this card if you are competitive, and that’s all that really matters in my eyes, kek. Having fun is important too, but it’s fun to win, and you won’t win as much with Millenium Scorpion around. Welcome to another week of TLM cards! Today’s card is Millennium Scorpion, one of the most useful Insects to have ever been released. At first glance, MS is far from a spectacular monster; 2000 ATK does of course beat the pants off of the ever-popular Airknight Parsath, but it’s much weaker than the standard one Tribute monster. 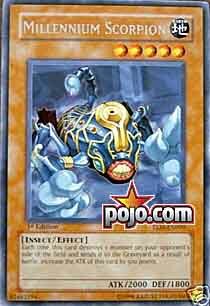 On the bright side however, MS is an Insect, which gives it access to a usually useless Spell Card, Insect Imitation. And because MS is a Level 5 monster, that makes II even better! All you need to do is Tribute a Level 4 monster with II and you can Special Summon MS from your Deck. While that may not seem like the best use of resources at first, MS’s effect makes this “combo” very helpful. 500(2) + 2000 = a 3000 ATK monster. Once you ignore this obvious space filler of a math lesson, it’s obvious MS can become a formidable monster with little effort. In fact, the only hurdle you need to cross is the first monster MS needs to destroy, which in retrospect should be relatively easy considering most Level 4 or lower monsters are considerably weaker than and un=power-boosted MS. All in all, MS is a very useful monster that all Insect Decks should highly consider using. Advanced: 4.5/5. Call it a higher rating than necessary, but MS can reach a high ATK before it’s inevitably destroyed, which I deem worthy of a near 5. Traditional: 3.5/5. It’s still a good monster, though it may not last long enough to reap the benefits of it’s ATK boost. Art: 1/5. !.!.!.! What king of scorpion is that?! FOUR pincers?! Psh. Coin Flip Millennium Scorpion is awesome in draft. In draft, this is a 2000 1-trib that can start taking out huge, huge things. After a while, the only things that can stop it are Kaminote Blow and Brain Control. But that is unimportant. Draft is not the most commonly played format. Let's look at it in normal format. Dear god, that is bad. 2000 ATK is low. Vlord has that, but he has a beastly effect to back him up. This guy gets ATK increases that won't help against DDA, DDWL, Smashing Grou- I don't even need to list individual removal cards. He's got one excellent thing going for him… He's level 5. Summon Skull-Mark Ladybug, tribute with Insect Imitation… Congrats, you just pulled out a 2000 for 2 cards and gained 1000 LP. At least he is better than Insect Princess in that regard. Dark Paladin Welcome to Broken Cards of The Lost Millenium Part 2 Week! Each time this monster destroys an opponents monster as a result of battle and sends it to the graveyard, increase the attack of this card by 700 points. Well, this is a decent card, and it's cool that the monster happens to be an Insect on accounts of there aren't that many truely fabulous cards for the poor Insects. But, he becomes more powerful if he destroys stuff. One monster destroyed makes this guy a 2500 attack monster and another can match Black Luster Soldier. Finally, a third allows him to take out Black Luster Soldier unless he got removed. This card is kinda like Emes the Infinity, but only requiring one tribute and his attack only goes up by 500, instead of 700. Millenium Scorpion isn't a bad card, and he's only a Rare, so it shouldn't be difficult to acquire. Traditional: 2.0/5 Monsters don't stay on the field long, so it will be harder to take advantage of his ability. Advanced: 3.3/5 Monsters have an easier time staying on the field here, so he could become dangerous. We start off the week with a rather underrated card, Millennium Scorpion. It’s Level 5 with only 2000 ATK, so it’s pretty weak; but on the plus side, it Morphs into Dark Balter the Terrible. It’s also an Insect, meaning he’s easier to summon with Pinch Hopper and Insect Imitation (especially because all you need to use II on is a Level 4, of which there are plenty). Whenever he destroys a monster in battle and sends it to the Graveyard, he gains 500 ATK. If he kills a Don Zaloog he’ll be at 2500. Then if he kills a Jinzo he’ll be at 3000. And so on…if you manage to keep Millennium Scorpion on the field long enough, chances are he’ll get extremely strong and will likely be able to finish off your opponent with one attack. That’s good. Of course, there are bad points, such as the relatively weak starting ATK value…but that shouldn’t deter you from giving Millennium Scorpion a try, especially in Insect Decks, which have a plethora of ways to summon him more quickly. Stats : Millennium Scorpion is a Level 5 Monster. This is fairly reasonable: it is obviously harder to Summon than something smaller as it requires one Tribute for a Normal Summon, but that isn’t too hard. It can also be dumped and revived like many other Monsters. Being a Level 5 also gives it some nice options with Metamorphosis. Millennium Scorpion is an Earth/Insect. The downside to this is that many of the best Insect Monsters are not Earth. The good news is that there are some that are, and they can be fairly useful. Earth itself is a strong element that boasts probably the strongest beatstick in the present game, Berserk Gorilla, plus some other useful cards. Being an Insect also has advantages I’ll touch upon in the Uses and Combinations section. Sadly, we do hit a low point for the card when we look at the ATK of 2000. The DEF of 1800 isn’t horrid, but it isn’t overly useful: most dedicated beatsticks are over 1800 ATK and thus it will merely protect against the majority of support Monsters. The DEF isn’t technically bad though, as sneaking a peek at the effect, anything a lot higher would usually be a waste. Effect(s) : For every Monster on your opponent’s side of the field this Monster destroys, you get to add 500 points to the ATK score. So if you summon this and can run over at least one actual Monster card (since tokens wouldn’t count as they don’t go to the graveyard), you’ll be at a very nice 2500 ATK, which point this goes from “meh” to “w00t”! A second successful kill puts this at 3000, meaning Black Luster Soldier-Envoy of the Beginning has to remove it from play too get by it. Combinations : This card is basically another solid Level 5 Monster, and that can work in a few different decks, but especially Earth, Insect, and of course, Earth/Insect. Howling Insect can fetch Pinch Hopper from the deck (as can Giant Rat, but not in DEF mode). Insect Imitation makes this card friendly to most decks: trade any Level 4 Monster for this. Looks like being an Insect is finally starting to pay off. Plus, you can use Metamorphosis to summon a Dark Balter the Terrible. Another bonus: a 2000 ATK lets it perform a fake suicide run against Berserk Gorilla: attack or be attacked, then activate good old Waboku. There are a lot of Monsters that are either used for effects or that get hit for negative effects after serving their purpose (like Goblin Attack Force). Great cards to use for fodder. Traditional : 3/5-Summon Breaker, use his counter, then Insect Imitation into a 2000 ATK beatstick you have the option of “morphing” into Dark Balter the Terrible. Note, this is complex, but useful, hence the 3/5 rating. Remember, that score encompasses a small “bonus” for being useful in certain specific deck themes… that aren’t that great here. Advanced : 3.65/5-Still a great general card, it scores higher as it becomes more effective here. Limited : 4/5-If you can get it out and kill one or two Monsters, you’ll build up a near unstoppable juggernaut. There would be no doubt that this would be played if it were a Light or Dark Monster. Since it is Earth, though, it has potential, especially for non-Chaos decks. I may be over-estimating the potency of the ATK increase, and the difficulty in adding Insect Imitation to decks, but even if I am, we still get a very solid Monster for Insect and Earth decks. Okay...what did we learn about ATK modifying cards all the way back when LOD came out? A card that pumps itself up ATK-wise with its own effect usually isn't that great. This is no exception. If it kills one thing, it can beat out the normal 1-trib monsters, if it kills 2 it can take on a BLS-Envoy...but you're honestly not going to get that far in the current metagame. Everyone's playing Bottomless Trap Hole, and has enough monster removal so this card won't mean jack.